This is my latest painting - 'Tyrannogothus'. 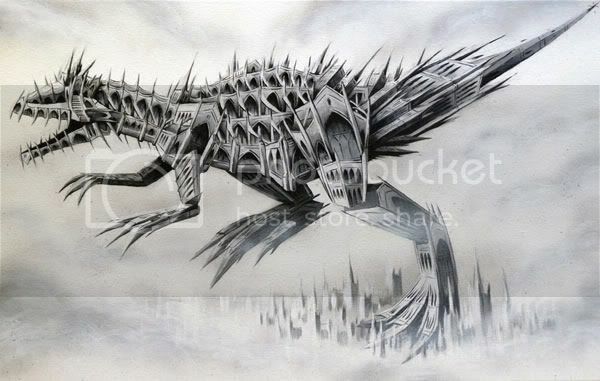 It is a Theropod type dinosaur that is a development from the Gothicasaurus drawing and window drawing that I did a few months back. 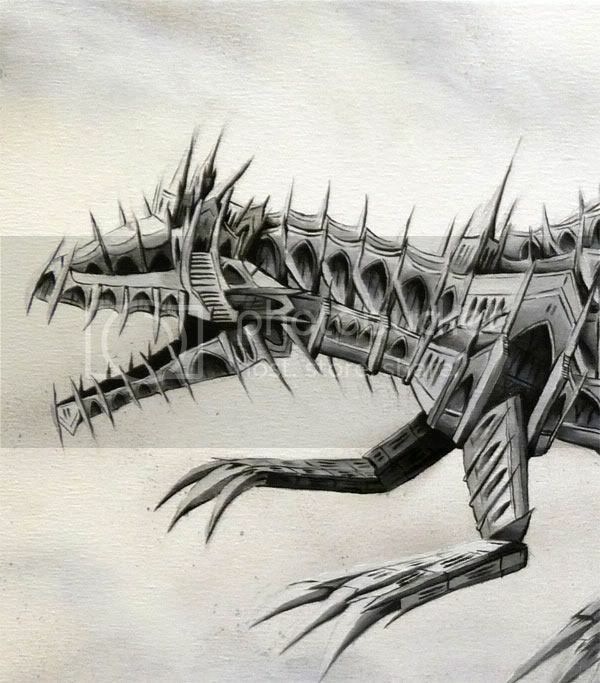 I used Charcoal, Acrylic and Spraypaint to create this beastie. I can't remember off hand how big the canvas is - it's over a metre wide I think. I think it worked out well for me just using black, white, grey and silver. It's a hint to Gothic music and relates back to work I did many years ago at college based around Bath Abbey. 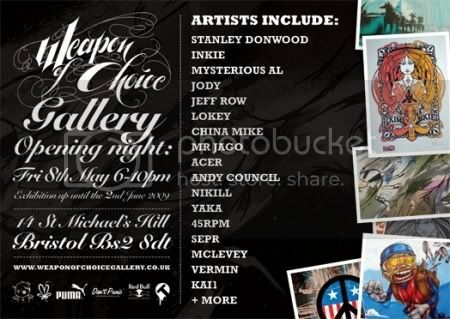 The painting will go on display along with a few other pieces of mine at the View Art Gallery, Hotwells, Bristol as part of Upfest on Saturday 6th June 2009. 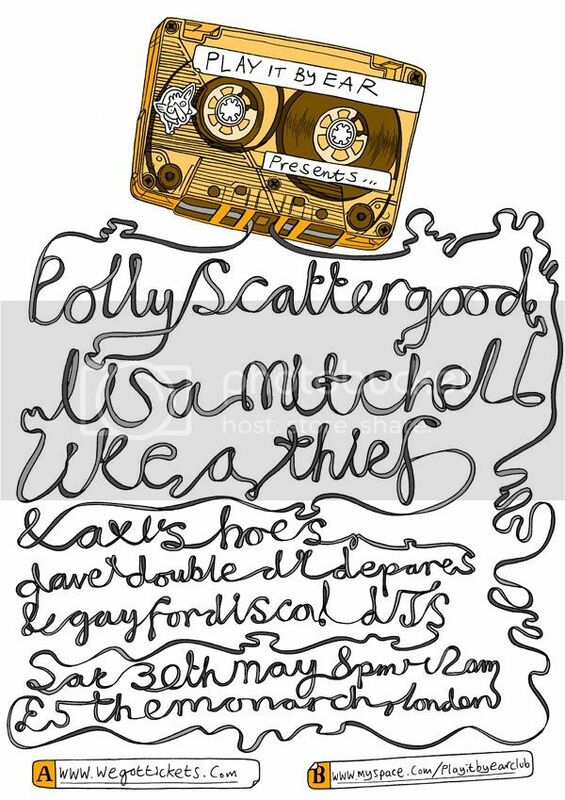 This is my latest poster design for Londons Play It By Ear club night...More info on the night over at their myspace. 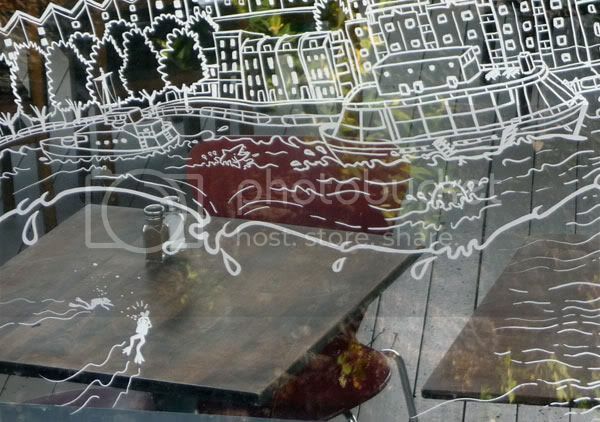 On tuesday I went along to the Grain Barge (boat restaurant/bar) in Bristol for a spot of window drawing. 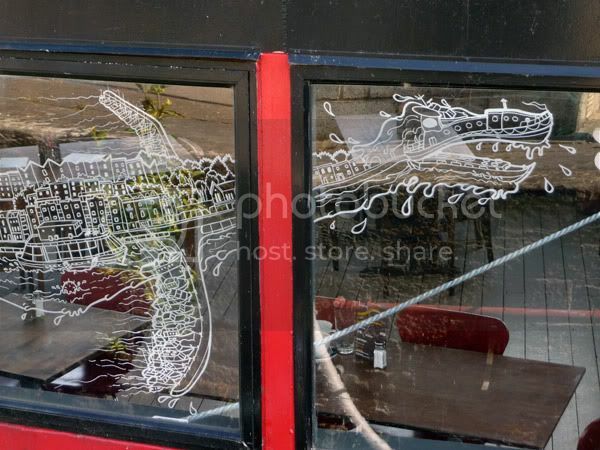 I didn't have time to get a full drawing made up to work from for this but had decided to do a sea-serpent type creature made up of boats and buildings of the surrounding area. I had read an article on the excellent Cryptomundo blog a while ago about how sea-seperents are likely to be discovered! A team of scientists conclude that three new unusual species might await discovery, all of which may belong to the group of marine mammals known as pinnipeds. The best known pinnipeds are seals, sea lions and walruses! Amazing! Giant long necked seal type creatures could be out there! Check the article and pics - wouldn't want to mess with these seals. 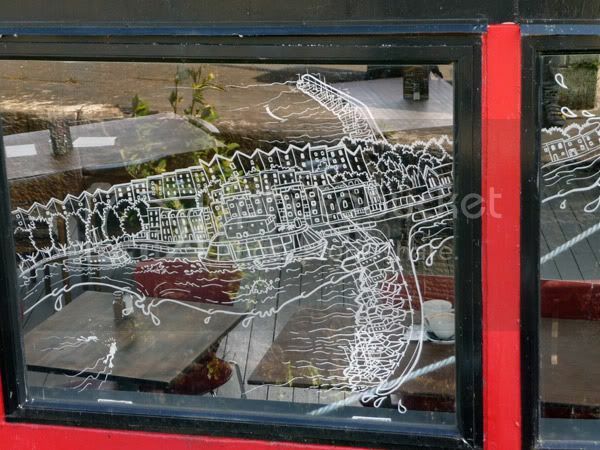 Anyhow, here's some pics of the triptych like window drawing I did. Turned out quite well from drawing from a few photo's I took and looking out of the windows. Close up of head section. Head made out of boats, water for under the neck and belly. Close up of back section. The grain barge is in there along with houses of Hotwells/Clifton Wood and Marina for flippers. Close up showing Grain Barge, a Sea Mine and two divers for scale! I had great day drawing in the sun and a really nice dinner there. Thanks loads to ace illustrator Dave Bain for hooking me up with this. and finishing with a gallery exhibition of the boards (and hopefully more work from you guys) at the Reebok Ultralounge in Shoreditch. I'm really pleased with how this turned out. 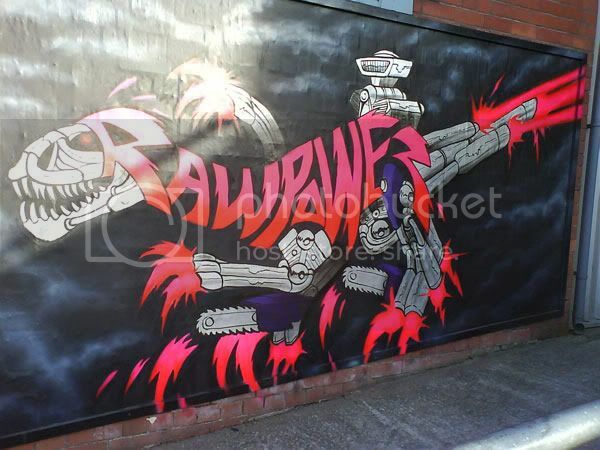 It's what I had in mind more when I painted the Raw Power piece the other week. It's nice and painterly and loose. Looks a bit like Giger too. I have just finished a couple of drawings as part of Kev Mundays Exquisite Corpse Sketchbook project. The sketchbook project is a take on the traditional art collaboration game 'exquisite corpse'. 50 artists from all over the world are being sent a sketchbook one at a time, and asked to draw half a piece on a page, plus finish half a piece by an artist on the previous page. They will then be asked to send the sketchbook on to the next person on the list, who will repeat the process. Kev Munday produces half a piece, then sends the sketchbook on to DBO. DBO finishes off Kev Munday's piece and produces half a piece on the next page, then sends the sketchbook to Mr Jago. 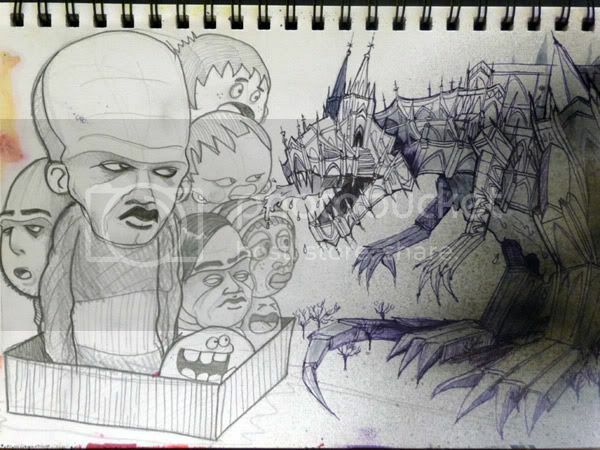 Mr Jago finishes off DBO's piece and produces half a piece on the next page, then sends the sketchbook to China Mike. Once the book is completed it is going to be published and exhibited, with each page for sale individually. Niko Stumpo on the left and my Gothic dino on the right. My start to the next page which is a kind of hot rod exhaust Triceratops. Now I have to send it on to Azhar Osman in Malaysia! 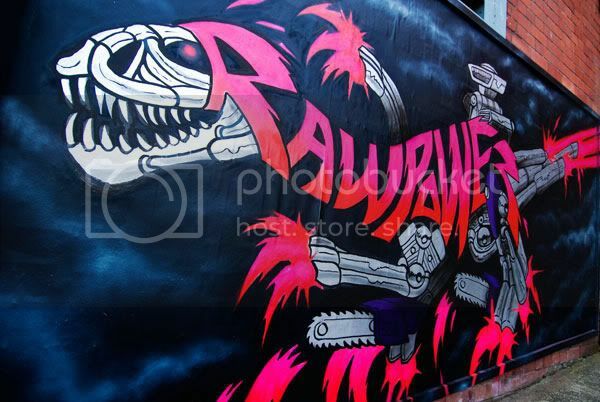 Here's a couple of better pics of the Raw Power Dino I did the other week at Tobacco Factory in Southville. Thanks to Paul Green for letting me use these. The Dino beastie can be seen in more of it's weird He Man like glory in these shots. Kind of like a steed of Skeletor - 'Beast Man you bumbling fool! ', 'Ah He Man!' 'Activate the Null Ray!' etc. Actually, that last quote is Megatron from Transformers I think. 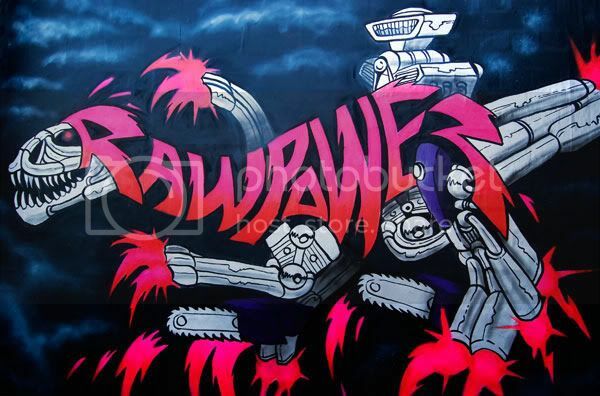 I wish I got outside and painted Graff in the 80's instead of watching cartoons and drawing pictures of squirrels with lazer guns. I spent yesterday doing a spot o painting down at the Tobacco Factory in Southville, Bristol. It was a warm up for Upfest and also part of the Southbank Art Trail. 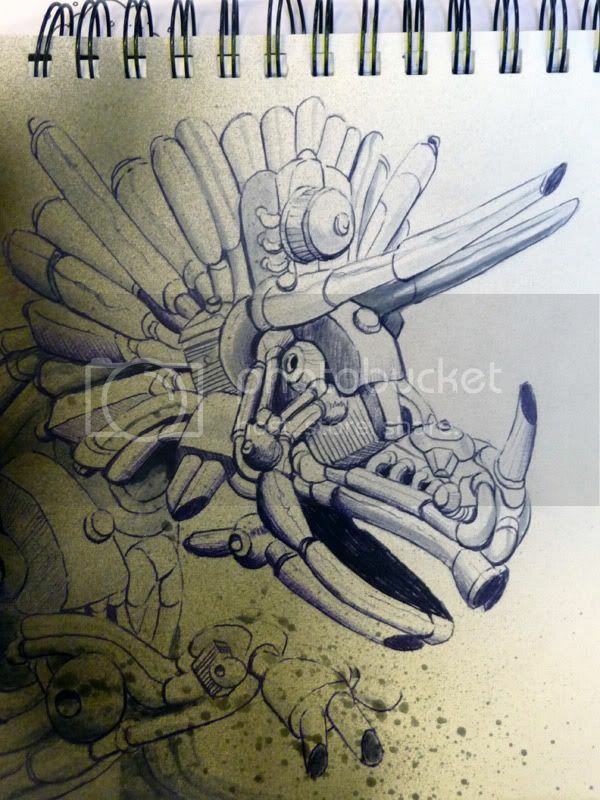 I drew up this sketch where the wall piece would be like one of my text dino's that I have been doing a few of lately. 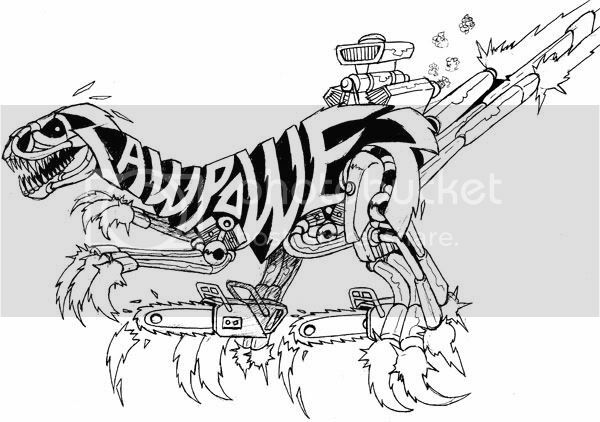 I thought it would be pretty cool to do a kind of punk rock dragster dinosaur. The text 'Raw Power' is taken from the Iggy and The Stooges album title. I used a font a bit like that of the Kiss logo. The tail, legs and arms are like motorcycle exhausts with flames coming out of them as claws. I put a couple of chainsaws in there too for good measure. Painting the piece was a bit trickier than I imagined. The Fluro pink paint needed a coat of white under it so that it would stand out, which meant that the piece took longer to do. The space available wasn't too big either and the legs got a bit squashed. 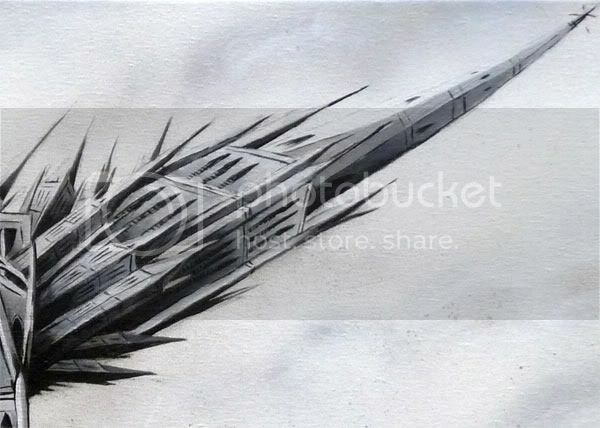 I was hoping for more space so that I could make it more painterly like my Stegocactus piece I did recently. I ended up going for a graphic finish with outlines. It kind of works, but I'm not sure about it. It looks a bit weird like the Terminator or something from He Man. I suppose that isn't a bad thing. The picture is pretty crappy - only had my camera phone on me. Will try and get hold of a good un to post up soon. Thanks to Steve, Scott, Jody, Matt, Adam, Jen and everyone else down there. Cheers for the drinks! 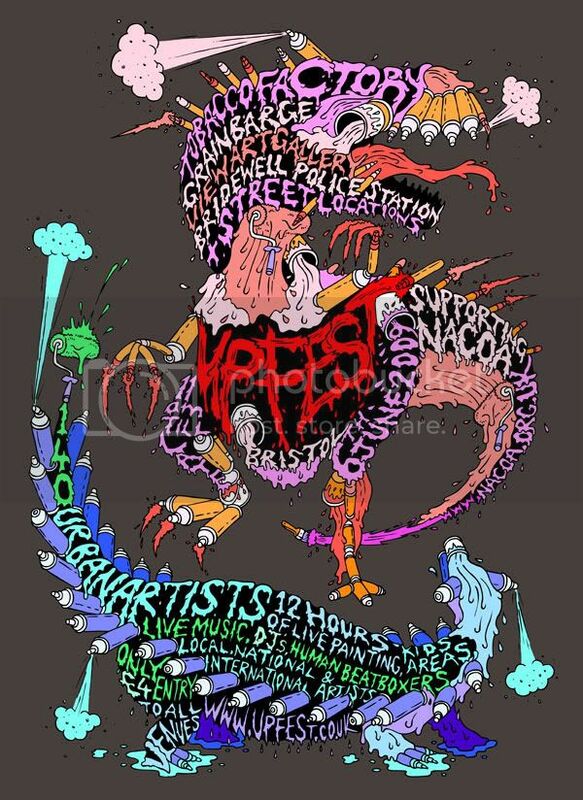 Poster design for Upfest 09. Urban Paint festival in Bristol UK. More info on the dinos! This is my new lil Acrylic on canvas piece. It's kind of a Triceratops head, but a bit more abstract. 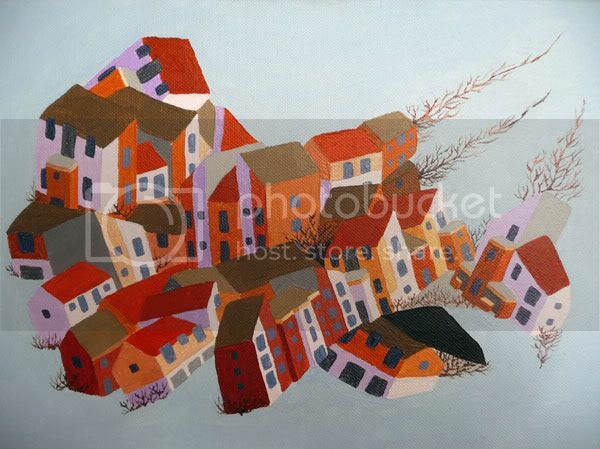 Based around new build housing estates like a few in North Bristol, including where I live. Makes me think of the 808 State album Newbuild. This painting is going on show as part of the new Weapon Of Choice gallery group exhibition.